Dr. Vincent Chen's research will help scientists understand cancer, heart disease and stroke. BRANDON – Funding announced today by the Natural Sciences and Engineering Research Council of Canada (NSERC) will help a Brandon University (BU) researcher’s work to create a better understanding of cancer, heart disease and stroke. 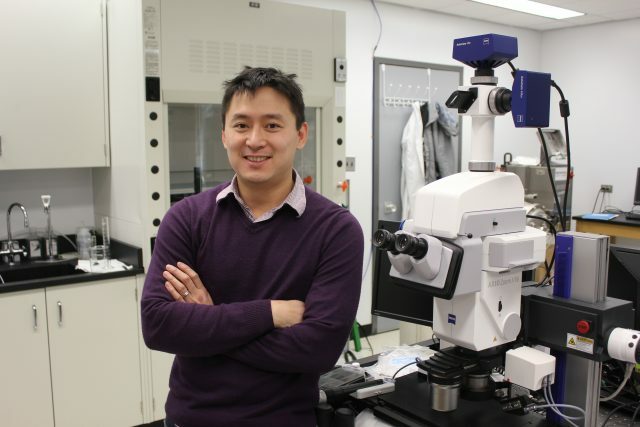 Dr. Vincent Chen, an Assistant Professor in BU’s Department of Chemistry, is a recipient of an NSERC Discovery Grant, with a value of $165,000 over five years. Chen’s lab at BU specializes in the study of gap junction ion channels that are responsible for direct cell-to-cell communication. The proteins making up these channels regulate a number of cellular processes including growth, proliferation and migration, as well as cell death and survival. The Discovery Grant Program is NSERC’s largest funding program. The long-term funding allows researchers to explore new pathways in their research as they are discovered. Chen becomes BU’s 11th active NSERC Discovery Grant holder, joining Drs. Margaret Carrington (Physics and Astronomy), Mousumi Majumder (Biology), Eric Bushnell (Chemistry), Bryan Cassone (Biology), Michael Charette (Chemistry), David Greenwood (Biology), Christophe LeMoine (Biology), Bernadette Ardelli (Biology), Sarah Plosker (Mathematics and Computer Science) and Wendy Untereiner (Biology). Brandon University student Harald Grove is also benefitting from NSERC funding, through the Alexander Graham Bell Canada Graduate Scholarship-Master’s Award. A student in the Master of Science (Environmental and Life Sciences) program, Grove will receive $17,500 in funding over one year for his study of the effects of microRNAs on metabolism in the greater wax moth. Greater wax moths are valued in research because they can often be used as a stand-in for mammals in the study of microbial infections. “We take great pride in the research opportunities that we can present to students at Brandon University,” said Dr. Meir Serfaty, Acting Vice-President (Academic and Provost) at BU. “The growth of our graduate programs has opened doors for top-notch student research. As Dean of the Faculty of Science, Ardelli says that BU is proving that high-quality research can be done at smaller universities.